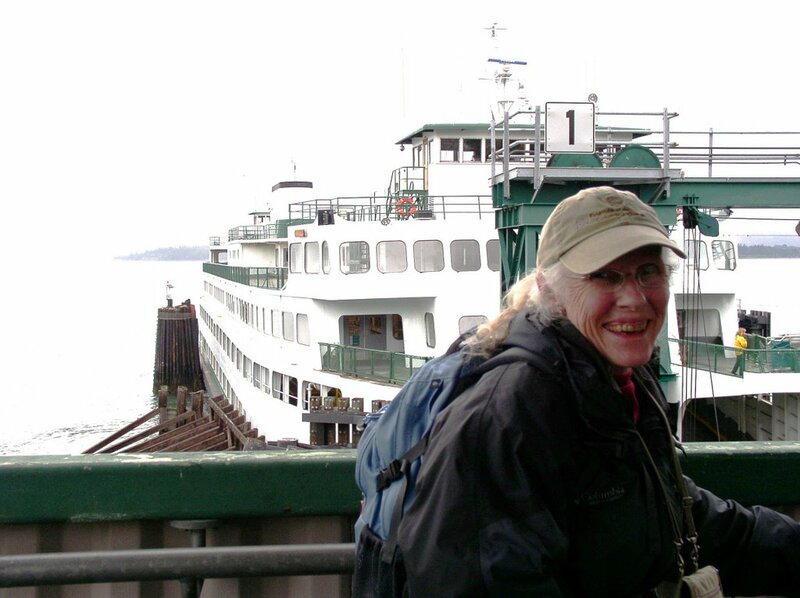 Leaving on the ferry for Friday Harbor where I’ll spend the night in the Historic Inn and then board the Delphinus on Tuesday morning May 30th for a trip up along the coast of the British Columbia Great Bear Rainforest and into the Inside Passage. Then I’ll make a return trip on the Alaska Marine Highway System ferry where I’ll set up camp in the solarium on the top deck. I’ll end up in Bellingham on Fri Jun 9. And from there make my way back home. No postings until June 11. This adventure is a long time dream come true! Last night I read through Down Home Musings, start to finish. Four months of entries in my blog journal that have now morphed into my first about-to-be-published book. A few of the originals were taken out, a few pieces from my other journal added. Some poetry had to be jettisoned due to publication rights. But essentially, it is what you read online daily, weekly, or sometimes, from July 2005 until I left Osceola in October 2005. Those magic summer and early fall days have now become a precious memory. The book proofs arrived via e-mail yesterday and I was up until midnight re-reading and searching for those dreaded typos. I poured myself a big glass of raspberry iced tea (my drink of choice on those hot days on the porch of Terrapin Station) and revisited my life back in Missouri. It seems so far away now. The tears came as I read the last entry. It was a special place…my little spot of earth to take care of for awhile…and I hold it dear. My life here in the Northwest is busier and less structured and more open to whimsy and happenstance. Good, I suppose, for me at this stage of my life. The best part of course is being with my family and you have read here about all they do for me. I know, too, that the Terrapin Station I remember and loved for five years, is not there anymore. Altered irreparably by new construction and zoning changes and the loss of some of the best neighbors. I also am different. Changed irreparably by aging and reduced abilities. Not to mention political breakdown, peak oil, global warming and other world issues that contribute to the inadvisability of living in a rural area in the middle of nowhere. But I miss it. I miss May and the emergence of the yard with flowers springing up in unexpected spots, the sound of the first thunderstorms, the crack of lightning, the smell of the fresh cut grass. I miss the porch and the sunrises, and the sunsets, and the clouds, and the sound of the wind at night. I miss Louie and Winkie (the cardinals) and Dudley Do Right (the downy woodpecker). I even…if you can believe this…miss Jump Stop Pizza. Do dogs have memory of place? It seems sometimes, as Princess stares off into the distance, that she might be thinking of that yard she loved and her kiddie wading pool. It was the first home for her and for Buddy. And the first home I owned all by myself. The memories linger on in the book. It’s a big decision, this one. When to take the electric blanket off the bed? Last week, when we had some warm days (one in the 90’s! ), it seemed the day had arrived. But part of the joy of being busy is that you put things off and sometimes that results in a good outcome. Never got around to taking the blanket off, and now that winter is back and the temp has dropped and the rain is pouring down, no more open windows and I woke up at 4:00 a.m. and clicked the blanket on for a few minutes as it was shivery cold. So it is not time yet. This week is one of the busiest in a long time. I am working six hours a day with two more hours for travel to and fro, plus getting all my things in order for my trip to Alaska. Plus caring for a sick cat, reading the proof of my book, paying bills, shopping, and running around like a crazy person. I finished the book, Blue Shoes and Happiness, and it was as good as the others in the series. On my list is a trip to the bookstore for reading material for my trip. Windy gave me a delightful bon voyage gift of travel size items that I will use every day while I’m gone. I will be carrying my own stuff and lightening the load is important. I love all the new mini items! She looks after my well being. Mt. Hood has her blanket wrapped around her this morning, keeping her hidden in the cloud shawl and invisible to us mere mortals. When she casts hers off, I will take mine off the bed. 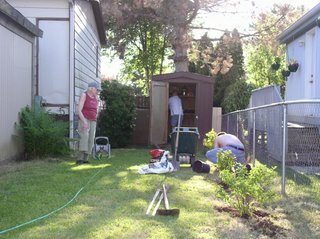 My Mother’s Day gift from the children was a weekend of yard work that included cleaning up downed branches, pine needles & cones, other debris, and weeds. A pick-up truckload went to the free Yard Waste Day recycling at the high school. Andy moved and reinstalled the fence separating the dog yard from the garden yard and it looks much better. 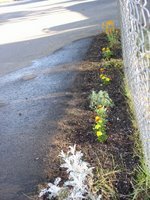 Phil planted a “bright spot” and wildflower strip along the streetside fence. Wonderful to look at as you drive up to the house and it will get brighter as the seeds burst into bloom throughout the summer. Scott took me to Portland Nursery and we wandered through acres of plants. From the native plants we picked out salmonberry which does well in the full sun of the side yard. Also purchased hibiscus (known in Osceola as Rose of Sharon) and a spiraea. The yard is beginning to look beautiful and we will continue to add to it throughout the summer. I inherited a giant (almost as tall as I am) Sword Fern. Everything else (invasive and bad choices that were planted by the previous owner) went out to the dump. Scott, et al brought a huge hanging fuschia and installed it on the deck outside the kitchen window (safe from the Gorge winds) and it greets me every morning. Andy found me a new version of the old-fashioned reel push mower and thanks to Windy we are keeping the grass cut (Donna would be thrilled!). 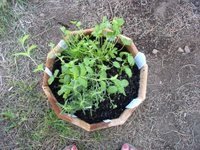 Windy helped to plant a small herb garden that lives on the front porch. 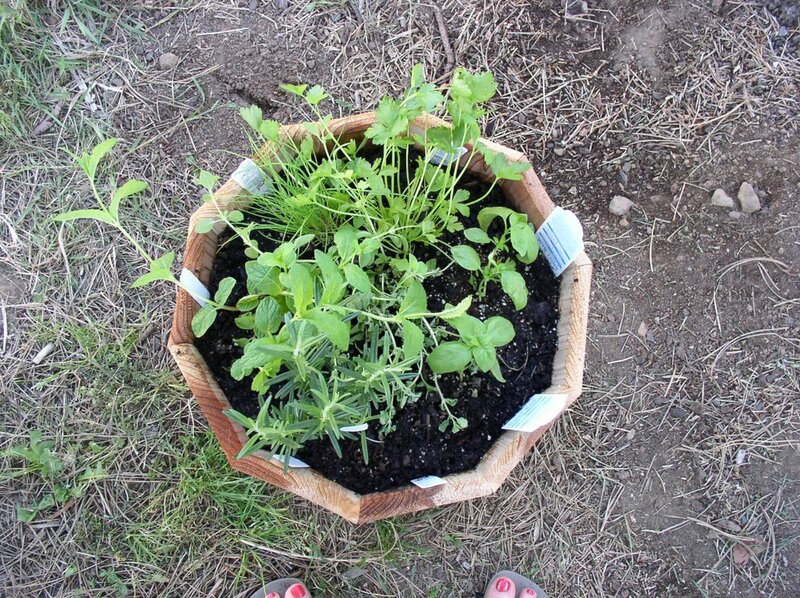 Basil, marjoram, rosemary, mint, chives, and Italian parsley. Also, Windy purchased a long, non-kinking hose with a winder contraption that makes it easy to roll up. And a magic wand with ten different types of sprays. What wonderful gifts that all came with the labor attached. What wonderful children! It may come as a shock to some that those of us who live near, and spend time in, the Sandy River Delta are not excited about Maya Lin’s proposed monumental monstrosity. 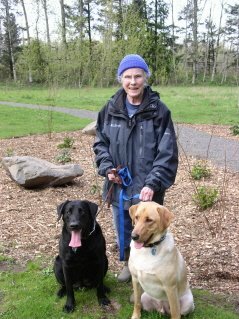 For the past six months, I have gone there nearly every day with my dogs to enjoy the peace and serenity of the rivers and the environs, enjoying the birds and wildlife, and now, wildflowers. You can walk along the trail and observe birds everywhere. You do not need a blind. Take an identification book and a little Lewis and Clark pamphlet and you will know more than a piece of wood slat will be able to tell you. Why do we want to bring in tourists in flip flops to drop fast food wrappers all over the place. The Delta is beautiful as is. Every time I am there, I think of Lewis and Clark and how they must have felt finding this astonishing place. Why change it into something it was not for them and now will be only another futile effort to honor a spot that is its own monument. Maya Lin is no friend of the environment. It was an interesting juxtaposition to feature a photo of her 2x4 Landscape of mutilated trees on Earth Day. The money donated to her projects would be better spent to address the issue of global warming. She seems only interested in preserving her own legacy, rather than letting Mother Nature pay tribute to herself. A weekend with my four children and Laura. Saturday was a work day in the yard, followed by an awesome taco/burrito dinner prepared by Windy with a yummy pineapple upside down cake baked (from scratch, as always) by Laura. 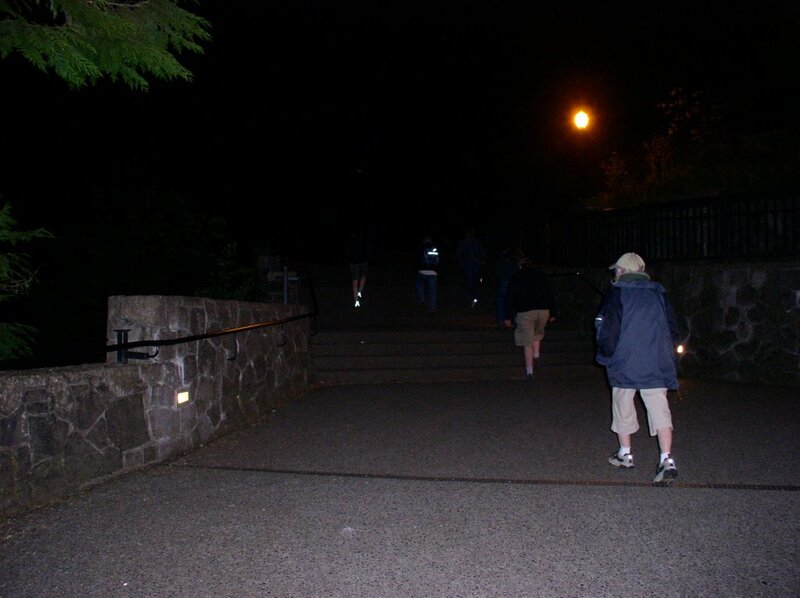 We ended the day with a Midnight Moonlight Hike to Multnomah Falls. Sunday was more yard work including a trip to Portland Nursery (acres and acres of plants!) and installation of some native plants and a wildflower garden. Also added a beautiful giant hanging fuschia to the deck, visible through the kitchen window and a wonderful welcome each morning. This is why I moved to Portland. On a related note, did you know more people voted for American Idol than voted for the President of the United States? Sounds like a major priority problem. My sister and I shared many family traits, one of which was reading and the love of a good book. For many years, we traded books and titles and our personal reviews and rejoiced when we found a novel or autobiography that kept us enthralled. We didn’t always share the same taste, however. That is what made our back and forth comments interesting and fun. Since she’s been gone, I sometimes feel like I read in a vacuum. Frances had a fear of weekends. Or rather a fear of going through the weekend without a good book, and when we both lived in The City, we made a habit of meeting on Friday afternoons and heading to a bookstore. It’s Friday today and I am thinking of her and how much she would have enjoyed the book I just finished, My Name Escapes Me, by Alec Guinness. A marvelous glimpse into the daily life of a very talented and renowned actor who writes of mundane things - what he had for dinner, what he was reading, the weather, and the birds outside his window. Being a diarist myself, I found the book captivating. After I finished it, I picked up The Tipping Point by Malcolm Gladwell which has resided on the New York Times Bestseller List for awhile. I am finding it didactic, preachy, repetitive and much like a text I might have chosen for extra credit reading when I was teaching Social Psych 101. I’ll finish it on the inbound commute and then I will be free to head to a bookstore for my weekend read. Unfortunately, Powells is too far to walk so I will be forced into Borders. Riding the Max, Portland’s rapid transit train, from a nearby Transit Center to City Center every day has put me in mind of the Muni commute in San Francisco. This is not the full body contact sport that The City offered, but the trip is still redolent with scents of hygiene products and non-hygiene emissions. Trains are crowded and no room to really work a crossword or knit. Same protocol as flying…keep your elbows in and your chin down and don’t make eye contact with anyone and don’t expect anyone to be courteous. The biggest change since 1995-1997 when I was living at Ocean Beach and riding an hour to downtown SF is the proliferation of cell phones. Twenty plus conversations going on around me as I try to read my book. I knew raising four noisy kids would prepare me for something! For the first time I am riding public transportation as an “Honored Citizen” which gives me the legal right (although not always the courage) to boot out the surly teenager or clueless yuppie from the Priority Seating Area. Fare is $.80 each way and it is best to have exact change as the ticket dispensers sometimes eat the paper money without releasing a ticket. Tri-Met riders are a microcosm of the metro population: young, old, in-between, frail, hearty, earthy people, bike riders, mamas and strollers, school kids, homeless, punks, gang bangers, office workers, blue collar workers, students…I could go on and on. Great people watching and occasionally an interesting conversation. It feels good to be out in the world again although most people look stressed and hurried and too many are frowning or looking sad. There is street construction everywhere. Eateries are putting tables on the sidewalk and flowers are blooming in the front yards of every house. Intimate views of back yards as well, not always so neatly tended. Absolutely the best way to see a city. Major life readjustment here as I have accepted a temporary, part-time job with Friends of the Columbia Gorge www.gorgefriends.org to fill in while they recruit and fill a vacant position. You may remember I was the runner-up in a fierce competition for an environmental spot with them back in January. When I didn’t get offered the job, I was relieved as I realized I did not want to make a long-term commitment. This is perfect as they expect to have someone hired by August and I will be back to retirement. Since they are in crisis, I was able to negotiate some good terms. I’ll work three weeks in May (starting yesterday) and then two weeks off for my trip to Alaska. Then three weeks in June and two weeks off for the trip to Colorado for the wedding. Then three weeks in July. A total of nine weeks. A welcome of influx of cash. Title is Conservation Organizer and essentially it is rallying the troops to fight the off-reservation casino in the Gorge being proposed by the Warm Springs Tribe. This tribe is my old friend from working in Central Oregon in the late 70s when we brought Head Start to the reservation. They have lost their spiritual compass, however, and now would like to pollute the National Scenic Area with a 600,000 square foot neon monstrosity, bringing traffic and pollution and ruining the beauty of the place. So I am riding the Max (with an “Honored Citizen” reduced fare) and leaving the animals to fend for themselves. They did okay when I was doing taxes and they will survive this as well. It is still light in the evening so plenty of time for our walks and other outside activities. I can read on the train as I did riding the Muni in San Francisco. And it is energizing to be downtown where so much is happening. So…time to pack up the briefcase and head out into the real world. No more schlepping around in my pajamas until noon. Today I set up my Alaska Camp in the middle of the living room. I had to confine the dogs and keep Lenny in another room as they all expressed a little too much interest. I put up the Sportstar tent I bought a few years ago when I went to High Sierra Music Festival with some of my closest friends. A happy memory! 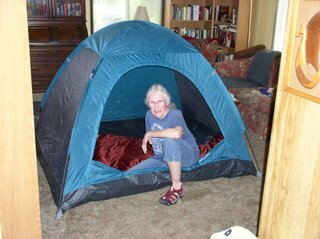 The tent smelled a bit musty as I have not used it since, although it has traveled with me to three different homes. It is still in good condition and has the benefit of being free standing and not requiring stakes which might be hard to drive into the deck of the Ferry Boat. It is so small I will have to sleep on the diagonal, but it will suffice to house my sleeping bag and pack and give me some privacy on the return trip on the Alaska Marine Highway System. From what I hear the “backpackers” set up camp in the solarium on board so I will be out of the weather at least. I don’t think the tent would stand up to wind or rain. It sounds like it will be fun although these old bones may have a hard time getting up after a night on the boards. To help a little I invested in a very lightweight (1 lb.) ThermoRest self-inflating pad. Size Women’s Small which is, unfortunately, pink, but actually about the same size as I am. On top of that I have a Columbia (surprise!) sleeping bag. And to rest my head upon, a little expando pillow that pops out of a tiny bag and fluffs and puffs up into a much larger cushion. So I am ready to go and three weeks from today I will be on my way. North to Alaska! Quick…call your bookie. Grab your fancy hat. Pick some mint. And break out the bourbon. Today is the 132nd Running for the Roses and Oregon is sending the favorite, Brother Derek, to the Kentucky Derby. This is one of the must-see sports events I always watch on TV. The race only lasts two minutes as the horses run the 1¼ mile track, but there is hoopla and folderol and, of course, the singing of My Old Kentucky Home, the lyrics of which have been sanitized and made politically correct. Today’s Derby is the first jewel in the Triple Crown of Thoroughbred racing. It’s always held on the first Saturday in May and is the most famous horserace in the world. You can skip all the stats and bloodlines. Just pick a favorite you like. Maybe Lawyer Ron or Brother Derek the bookies favorites. Maybe Storm Treasure or Steppenwolfer, long shots but great names. Choose by name, color, jockey outfit, whatever suits your fancy. Get your bets in and hope for a Trifecta. Kick back, relax, and watch how rich people waste their money. Cynthia Wheat Diekroeger 1935 - 2005. Yesterday there came news, listed in the back pages of an alumnae magazine, that a high school friend died last December. We were close while attending Southwest in Kansas City and stayed in touch while we were in college at different schools. She went to MU and I went to Boulder, and we both joined the same sorority. We later lost touch with each other. Last summer when I was sorting old photos to take to my 50th Reunion, I found a yearbook photo of her and a note of encouragement she wrote me when I started at the University of Colorado and was very, very homesick. Another loss. It seemed more like October than May as I went to bed last night. The weatherman on TV issued a warning to cover the plants as an overnight freeze was expected. The streetlight down the block was making eerie shadows on the frosted glass of the bathroom window, and there was enough wind to make the branches on the pine tree scrape on the roof. Luckily I had not yet planted anything in the yard. And luckily also, I had not taken the electric blanket off the bed. I continue to be grateful for my Columbia coat with a fleece lining, my wool cap and wind mittens. Attire for my trip to Alaska but handy here in Wood Village as well. Yesterday, May 1, was Beltane, the start of Celtic summer. Ha! Maybe in Scotland, but for sure not here in Portland. It was also the date my parents were married in 1920, eighty-six years ago. That is when they made the purchase of the walnut dining room set with the table we all sit around today and that has been the site of many family gatherings and happy meals. Today I am headed into town for a book signing at Powell’s Home and Garden Store on Hawthorne Street. Debbie Stoller who writes great how-to books that are hysterically funny at the same time as providing some creative ideas for handcrafts will be giving a reading. On the way (errand clustering again), I will drop by a kennel where we are thinking of boarding the dogs while we are all in Colorado. The sun is shining and the absence of rain is always welcome. Another day in my life. Today is International Workers Day. Here in Portland, as in many cities across the country, people are taking to the streets to defend the rights of immigrant workers. Dressed in white and waving American flags, workers, families, supporters and, occasionally, employers swarm the downtown streets to make their statement about the current administration’s efforts to deport or criminalize thousands of people. Most touching are the young children who are legal citizens pleading for their parents’ and grandparents’ right to remain in this country. This takes me back to the 70s in San Francisco and Central California where we boycotted grapes and marched to support Cesar Chavez and the Farmworkers. Thirty years later, same problems with callous treatment of the underclass that supports our economy with their daily labor in fields, factories, and the homes of the well-off. If I were still in Osceola, I would dress all in white and stand (probably alone!) on the courthouse lawn as I did to protest the War On Iraq. Here, I am only a tiny dot in a sea of humanity making a statement for freedom. Ironically, it comes at the same time as Amnesty International gathers here for its conference on human rights.